Humankind’s invention on the supplementary sources of light depended on the availability of substances and it got evolved over the years. When men lived in caves, the form of light source was to burn oily nuts in clay saucers, handful of moss soaked in animal fat. It is found that during the Iron Age, the Canaanite Oil Lamp saucer lamp was used from 1500BC to 600BC. Till 1700s only oil lamps, oil lanterns and candles were the only source of light until the petroleum was developed. After that the kerosene lamps/lanterns that lasted for longer time was used. The non-electric lanterns used in these days in the form of candle lanterns, kerosene lanterns, oil pots were discovered thousands of years ago. These oil lanterns were developed to replace candles. Lanterns were invented to act as a protective enclosure for light source. This is the easier way to carry candles/diyas and to hang up. These are perfect for outdoor decorations also used in drafty interiors such as passages and staircases where unguarded candles were blown out easily by gusts of air, not only by the wind also while opening the door or windows. The lanterns were of eight, five and six sides but four sides used to be standard. They are usually made using translucent material but some antique lanterns were made out of metal grids. Though the primary reason for inventing lanterns is to prevent light from being extinguished later it was equally important for functioning as the risk reducing gear that avoids the spark leap from the flame or the light be dropped. This was essentially needed below deck on ships. These lanterns were also used as torches and for signaling apart from using it as general outdoor light sources at night. The term “lantern” is commonly associated with the Chinese paper lanterns. Lanterns are used in many Asian festivals. Chinese captured fireflies in translucent containers and used them as lanterns. This was also practiced in ancient India. During the Lantern festival numerous designed and sized lanterns are displayed on the fifteenth day of the first lunar month throughout China. It is usually held between September or October month and celebrated as the Mid-Autumn festival. This festival originated as the thanksgiving for successful harvest that reflects the China’s history as an agricultural society. The tradition of this mid-autumn festival’s paper lanterns dates back to the Tang Dynasty (A.D618 – A.D907). Emperor Tang commissioned to construct thirty enormous lantern-towers which were of 1500 feet high each. These lanterns were also decorated ornately with silver, gold, precious gems and jade. Though such lanterns were never being replicated in the later days still the tradition of lantern took hold in the form of transparent paper on thin silk. Hence even on other Chinese festivals, lanterns are floated in sky. During the Ghost festival at China, lanterns of lotus shape are set floated in rivers and seas to represent it as a symbolic guide for the lost souls of forgotten ancestors to the afterlife. Lanterns are the central theme of the Seoul Lantern Festival as well! In India lanterns made of wooden sticks that are covered with color papers are well known. These are called as “kandeel”. ‘Kandeel’ is a Sanskrit word that is referred as a ‘lantern of the sky’ (akasha deepa) and also as ‘nested light’ (goodu deepa) in kannada language. This type of lanterns is usually hung in front of houses during Diwali festival. In ancient times Hindus set the lanterns fly high in sky as a gesture to invite the spirits of their ancestors to come back home and accompany them during the festival season. Thus it was called as ‘lantern of the sky’ (akasha deepa). These lanterns are traditionally built in a crystal shape with tails at the bottom. Papers and fabric cut into complex design enhances the beauty of these traditional lanterns by blocking some light behind it. Prashanth Rajaram Pardeshi from Nashik is well versed in making Traditional Indian Lanterns. He has learnt this craft from his ancestors since childhood. Diwali being the festival of light and colors has the utmost significance in Indian culture. 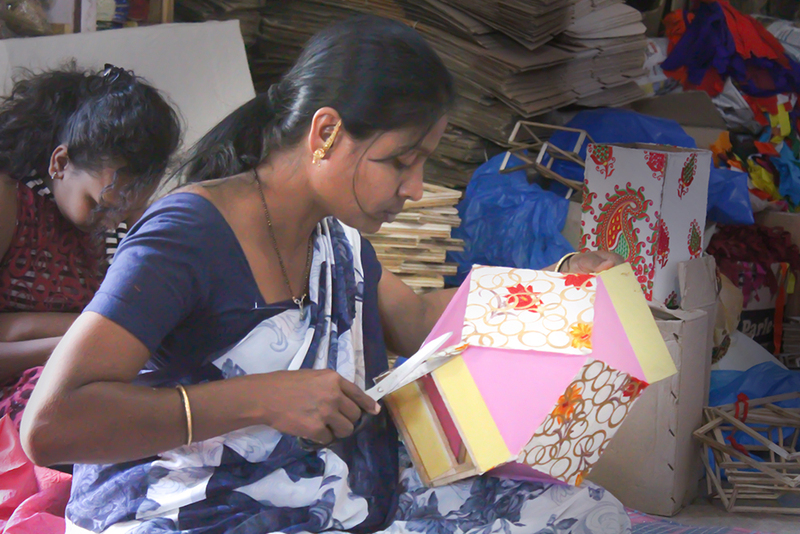 Considering this point, colorful handcrafted lanterns are made in this manufacturing unit. Initially these lanterns were manufactured in the artisan’s house. Earlier bamboo sticks, color papers and natural glue were used to manufacture the lanterns. But in later days, it became the dying craft of India. Thus by considering this point, the idea of getting the old tradition back, the manufacturing of these traditional Indian lanterns was started in 2007. Thus the childhood hobby turned out to be the serious profession for the artist in the later days. As the handcrafted lanterns were very rare during the establishment of this manufacturing unit, they got the very good response. This enabled them to capture the business well in market. Further for the improvement of lanterns by doing research they got to know that the shelf life of the bamboo sticks is less and manufacturing the lanterns using bamboo sticks was also very difficult. 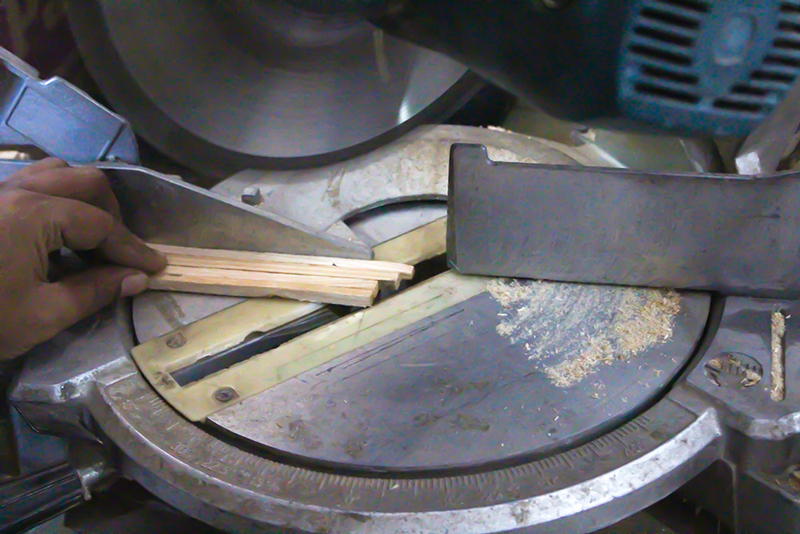 Thus the artisan came up with the idea of using wooden sticks. But realizing the cost-efficiency and the contribution to the deforestation by using wooden sticks, artisan started to use recycled wood. Thus the wood was allocated from the large-scale industries. For example: the wooden sticks used at packaging industries were allocated. The recycled wooden sticks used to make the lanterns are cut into required form. 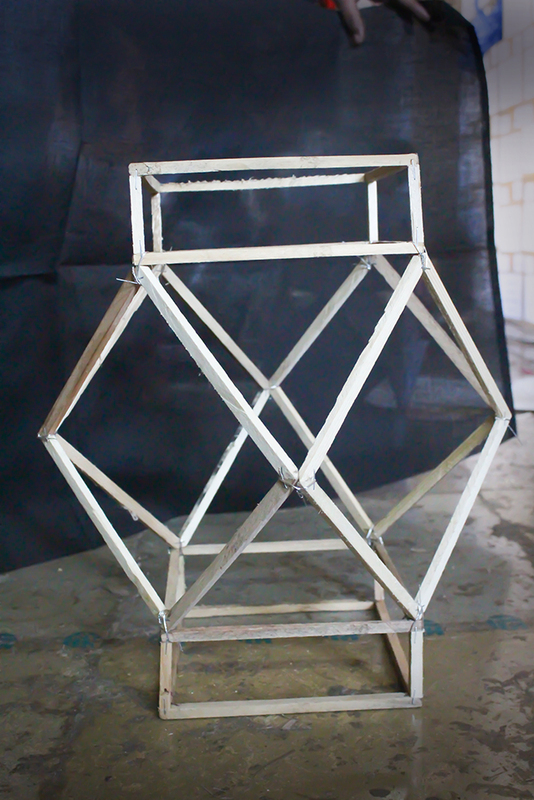 These traditional lanterns are created using the mathematical formula of cubic theodrome. This shape of lanterns was given by the ancestors, as it is the oldest form of geometrical shapes. Those old geometric forms are now a days studied in engineering syllabus. The shape of this traditional Indian lantern has ten sides. These ten directions/sides have utmost importance in Hindu Vaastu Shastra (Science of architecture). Thus it is considered that the legends used this form wisely by knowing its importance. Initially the making of these traditional lanterns begun using bamboo sticks and color papers. But as per the research and adoption of modern techniques bamboo sticks were replaced by wooden sticks and color papers were replaced by fabrics due to the lack of sustainability. Again as the company faced the problem of cost efficiency and to avoid textile waste, lanterns were made using the waste fabric from large-scale industries. Though this was the initial stage of establishing this manufacturing unit later as the company established well these handcrafted traditional Indian lanterns were exported to other places. The company also thrived for the women welfare association by appointing women employees in this industry. As the modernization took place in the making of these lanterns, canvas gun, circular saw and stick gum were used for preparing the lantern. 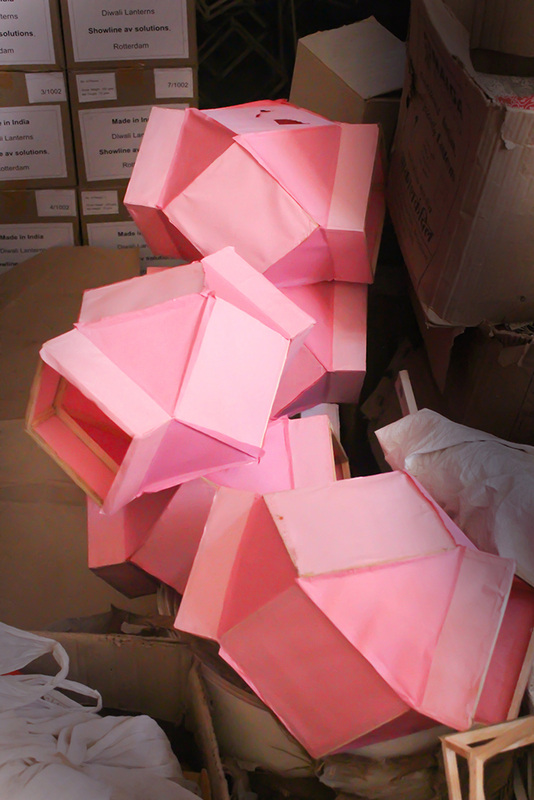 Using the basic shapes like triangles, rectangles and squares traditional lanterns are made. It consists of eight triangles, eight squares and eight triangles, by using these shapes a traditional Indian lantern is made that consists of ten sides/directions. On the armature, paper is stuck as the emission of light through paper is more and on that is the fabric stuck which is used for the durability purpose. Usually it takes 4-5 days to create a lantern. 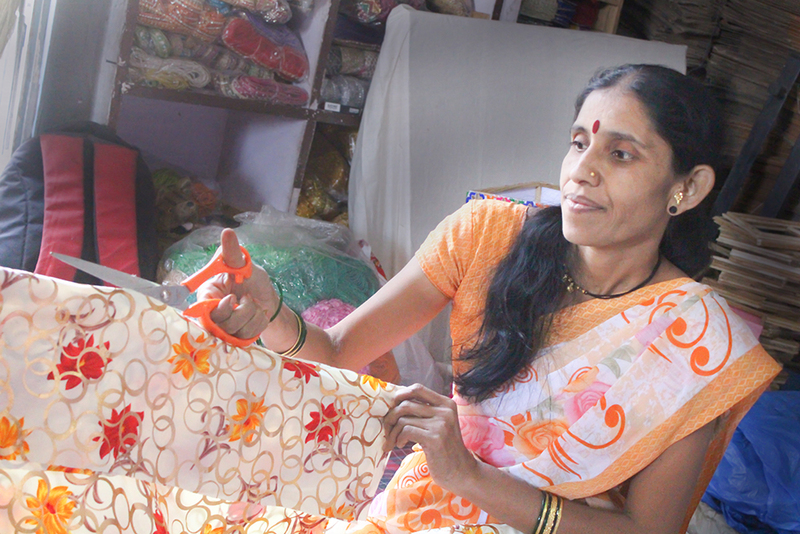 They also conduct traditional Indian lantern making workshops throughout Nashik.